Serge Lang (May 19, 1927 – September 12, 2005) was a French-born American mathematician and political activist. 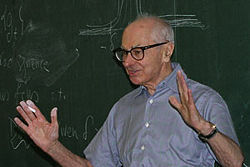 His most important mathematical contributions were in the field of number theory, especially diophantine geometry, and he is best-known for his books, in particular Algebra, his graduate-level introduction to abstract algebra. He was born outside Paris, growing up in Saint Germaine en Lyne, one of three children (he had a sister and twin brother) to his. His mother was a concert pianist and his father was a businessman. When Lang was in his teens, his family moved to Los Angeles, where he graduated in 1943 from Beverly Hills High School. He would later attend Cal Tech, earning his bachelors in physics in 1946. After a year and a half of service in the U.S. Army, Lang entered the graduate program in philosophy at Princeton University, which he abandoned after a year in favor of mathematics. After doing his thesis, he then worked on the geometric analogues of class field theory and diophantine geometry. Later he moved into diophantine approximation and transcendence theory. He made a number of conjectures in diophantine geometry: Mordell-Lang conjecture, Bombieri-Lang conjecture, Lang's integral point conjecture, Lang-Trotter conjecture, Lang conjecture on Gamma values, Lang conjecture on analytically hyperbolic varieties. A break in research while he was involved in trying to meet 1960s student activism half way caused him (by his own description) difficulties in picking up the threads afterwards. He wrote on modular forms and modular units, the idea of a 'distribution' on a profinite group, and value distribution theory. He was also a member of the Bourbaki group. He was a prolific writer of mathematical texts, often completing one on his summer vacation. Most are at graduate level and aimed at those intending research in number theory. He wrote calculus texts and also prepared a book on group cohomology for Bourbaki. Lang's Algebra, a graduate-level introduction to abstract algebra, was a highly influential text that ran through numerous updated editions. His Steele prize citation stated, "Lang's Algebra changed the way graduate algebra is taught...It has affected all subsequent graduate-level algebra books." It contained ideas of his teacher, Artin; some of the most interesting passages in Algebraic Number Theory also reflect Artin's influence and ideas that might otherwise not have been published in that or any form. Lang was noted for his eagerness for contact with students. Many of his students at Yale considered him to be one of the greatest teachers of mathematics in the world. He won a Leroy P. Steele Prize for Mathematical Exposition (1999) from the American Mathematical Society. In addition to being a mathematician, Lang spent much of his time engaged in politics. He was also engaged in several "whistle blowing" crusades to challenge anyone he believed was spreading misinformation or misusing science or mathematics to further their own goals. Lang kept his political correspondence and related documentation in extensive "files". He would send letters or publish articles, wait for responses, engage the writers in further correspondences, collect all these writings together and point out what he considered contradictions. He often mailed these files to people he considered important; some of them were also published in his books Challenges (ISBN 0-387-94861-9) and The File (ISBN 0-387-90607-X). He was active in opposition to the Vietnam War. He volunteered in the 1966 anti-war campaign of Robert Scheer (and later wrote a book about it entitled The Scheer Campaign). He later quit his position at Columbia in 1971 over the university's treatment of anti-war protesters. He attacked the 1977 Survey of the American Professoriate, an opinion questionnaire that Seymour Martin Lipset and E. C. Ladd had sent to thousands of college professors in the United States, accusing it of containing numerous biased and loaded questions. This led to a public and highly acrimonious conflict. In 1986, he challenged the nomination of political scientist Samuel P. Huntington to the National Academy of Sciences, claiming that his research consisted of "political opinions masquerading as science." The challenge was successful. His most controversial political stance was as an AIDS dissident; he maintained that the prevailing scientific consensus that HIV causes AIDS has not been backed up by reliable scientific research, yet for political/commercial reasons further research questioning the current point of view is suppressed. In public he was very outspoken about this point and a portion of Challenges is devoted to this issue. Later in his life, Lang expanded his "challenges" to include the humanities. For example, he fought the decision by Yale University to hire Daniel Kevles, a historian of science, because he disagreed with Kevles' book The Baltimore Case. Jorgenson, Jay; Steven G. Krantz (May 2006). "Serge Lang, 1927–2005". Notices of the American Mathematical Society 53 (5): 536–553. This page was last modified 12:16, 9 June 2009.